Rt. 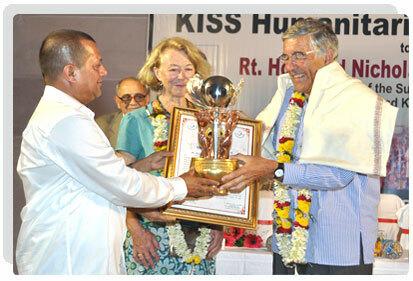 Hon Lord Nicholas Addison Phillips, President (Chief Justice) of the Supreme Court of U.K. receiving the KISS Humanitarian Award 2011 from Dr. A. Samanta, Founder, KIIT & KISS and Smt. Saswati Bal, President, KIIT & KISS. Ms. Christylle Phillips (wife of Rt. Hon Lord Nicholas Addison Phillips) also graced the occasion. (L) Dr. A. Samanta, Founder, KIIT & KISS, Ms. Sujata Sen, Director (Education), British Council, East India, Mrs. Nariman (wife of Shri Fali S. Nariman), Shri Fali S. Nariman, Sr. Advocate, Supreme Court of India, Prof. J. Martin Hunter, Emeritus Professor, Nottingham Trent University, UK, Rt. Hon Lord Nicholas Addison Phillips, President (Chief Justice) of the Supreme Court of UK, Ms. Christylle Phillips (wife of Rt. Hon Lord Nicholas Addison Phillips), Smt. Saswati Bal, President of KIIT & KISS, Rt. Hon Lord Anthony Peter Clarke, Justice of the Supreme Court of UK and Ms. Rosemary Clarke (wife of Rt. 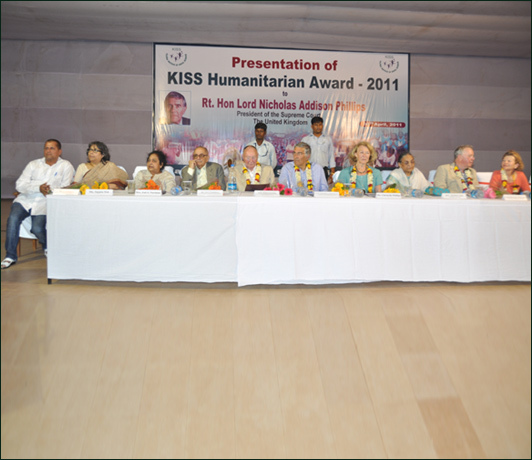 Hon Lord Anthony Peter Clarke) at the presentation of KISS Humanitarian Award-2011 ceremony. Rt. 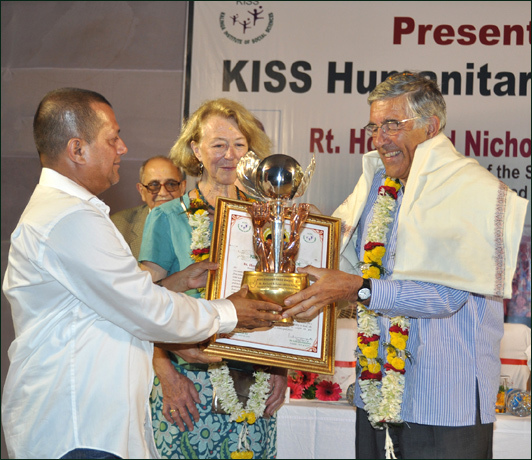 Hon Lord Nicholas Addison Phillips, President (Chief Justice) of the Supreme Court of U.K. receiving the KISS Humanitarian Award 2011 from Dr. A. Samanta, Founder, KIIT & KISS. Ms. Christylle Phillips (wife of Rt. Hon Lord Nicholas Addison Phillips) looks on. Rt. 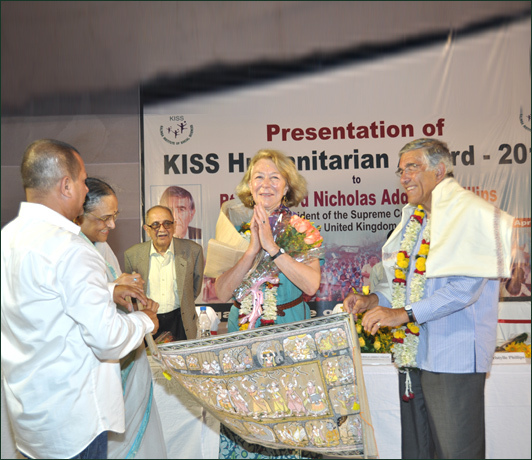 Hon Lord Nicholas Addison Phillips, President (Chief Justice) of the Supreme Court of U.K. Ms. Christylle Phillips being felicitated by Dr. A. Samanta, Founder, KIIT & KISS.